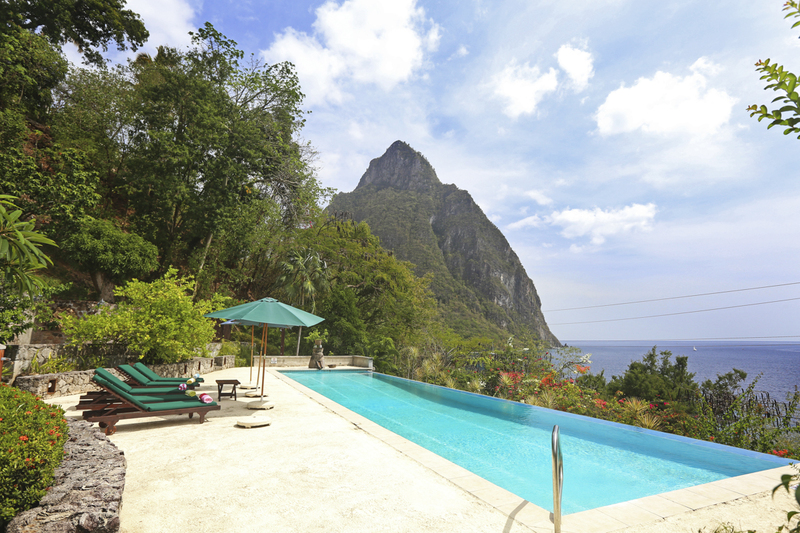 Overlooking the sparkling Caribbean Sea on the western coast of Saint Lucia, flanked by the Petit Piton and tropical greenery, Colibri Cottage is a peaceful, luxurious retreat. With flexible accommodation sleeping up to twelve people, this wonderful tropical home is where you can escape to with either a small number or friends and family or gather together for a group celebration. 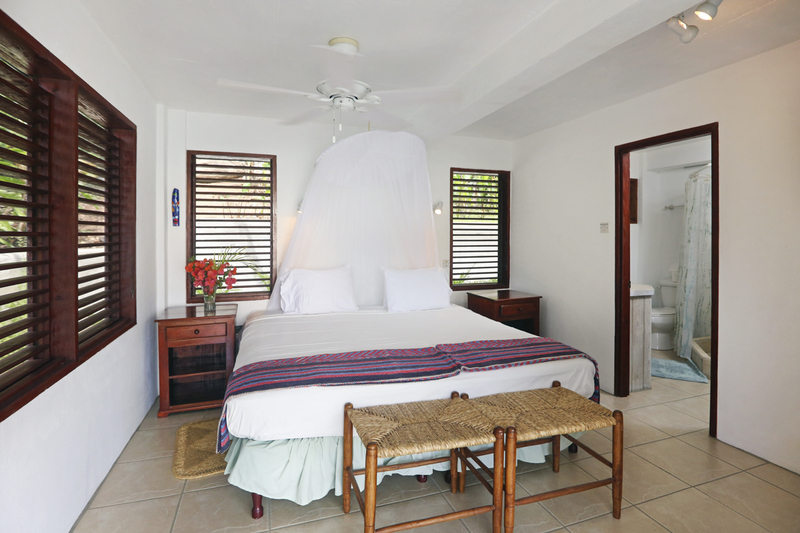 Colibri Cottage consists of two buildings. 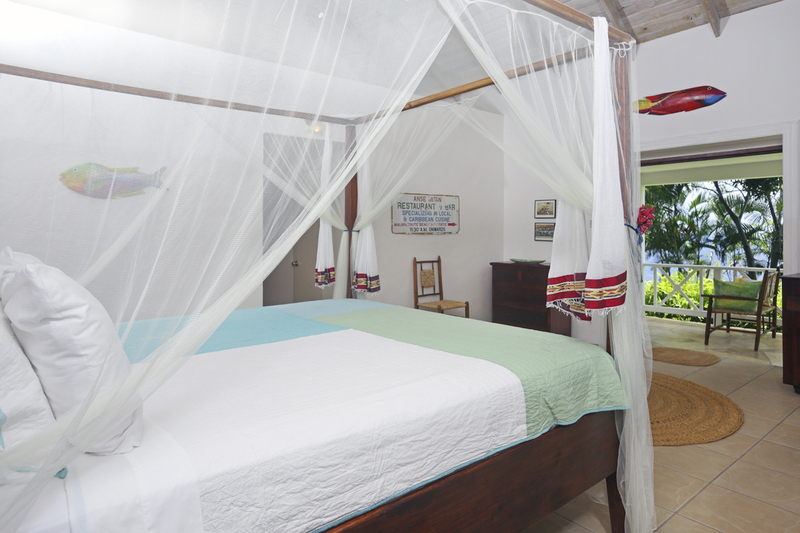 The main villa provides two sumptuous bedrooms, featuring king size four poster beds, en-suite bathrooms and gorgeous views. An adjacent, detached villa is where your remaining bedrooms are found but the accommodation is discreetly divided into two self-contained apartments. Each apartment has two bedrooms, with the beds available either as twins or, when zipped together, as a king size double. You also have a living-kitchen space, ceiling fans, two bathrooms and the most incredible views from the long, inviting verandah looking out to sea. 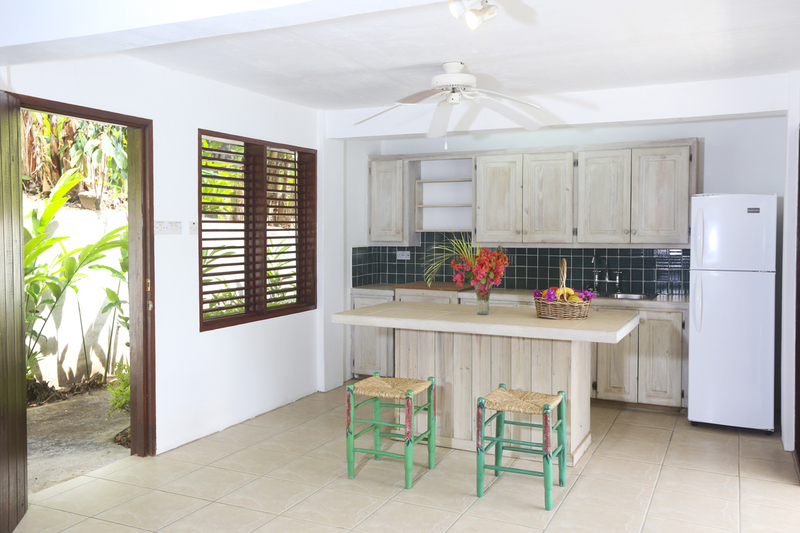 Back in the main house, your cosy living room, dining room and kitchen, where fresh white walls, dark wood furniture and pops of tropical colour thanks to locally grown flowers and fruit, leave you in no doubt as to your heavenly, Caribbean location. 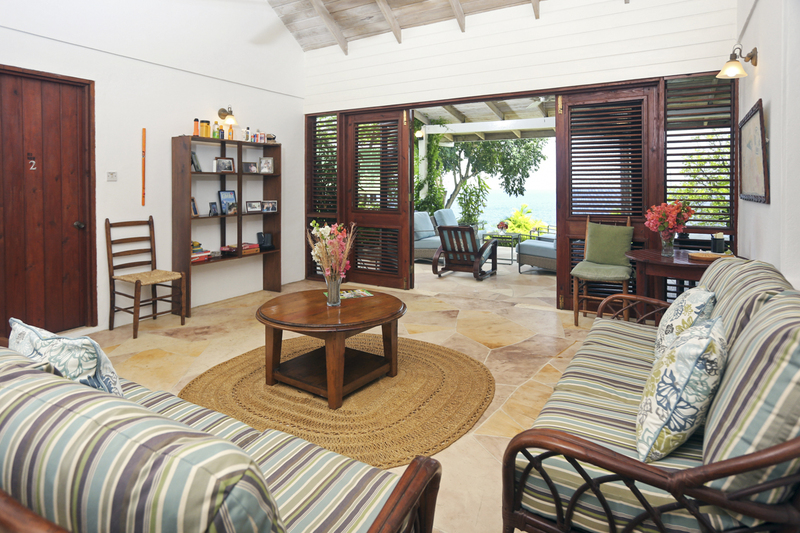 Move through the shutter doors to discover Colibri Cottage’s real wow factor – your breath-taking outdoors. A large, covered living and dining terrace boasts comfortable lounge seating and a good-sized dining table. This fabulous space is where everyone can come together, in the cool shade, and share relaxed times and al fresco meals. Your housekeeper is available to cook breakfast or lunch every day, ensuring you take it easy, sit back and soak up your delightful surroundings and views. 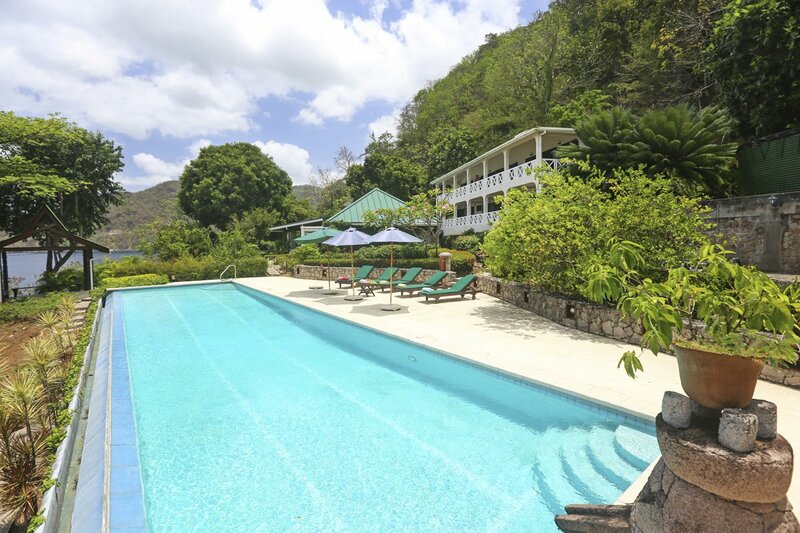 Beyond the terrace, your tropical gardens bask in Saint Lucian sunshine and are burgeoning with palm trees, flowering plants, birds and butterflies. The blue of the Caribbean Sea provides a glistening backdrop and lures you further down the lawn, yet your eye is drawn by your impossibly long, infinity edge, swimming pool. Wow! 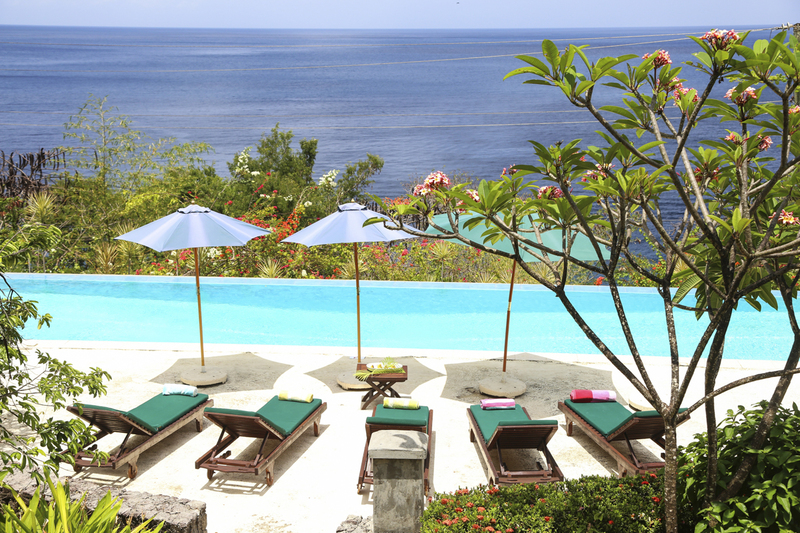 Claimed to be the longest private pool on the island, it’s all yours for swimming to your heart’s content, splashing with family and friends, cooling against the hot sun and just gazing out to sea. Welcome to paradise! The pool terrace is broad, fringed with tropical flowers and dotted with sun loungers and umbrellas. Long, hot, sunny, lazy, blissful pool-side days await. 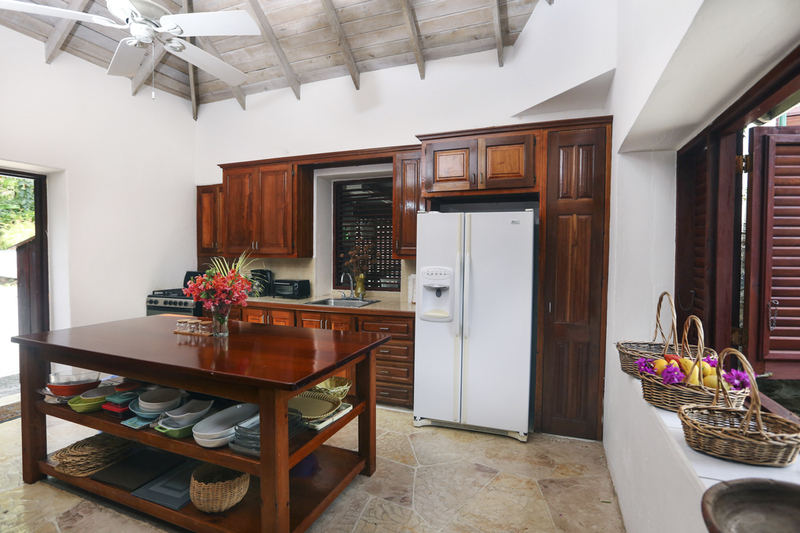 Colibri Cottage is a villa that just keeps giving, as your nearest beach is only a short walk away, taking you even closer to Petit Piton; the impressive landmark just along the coast and neighbouring World Heritage Site. If you want to discover more of this beautiful island, Soufriere town is a short drive and you have a choice of gorgeous beaches within easy reach. 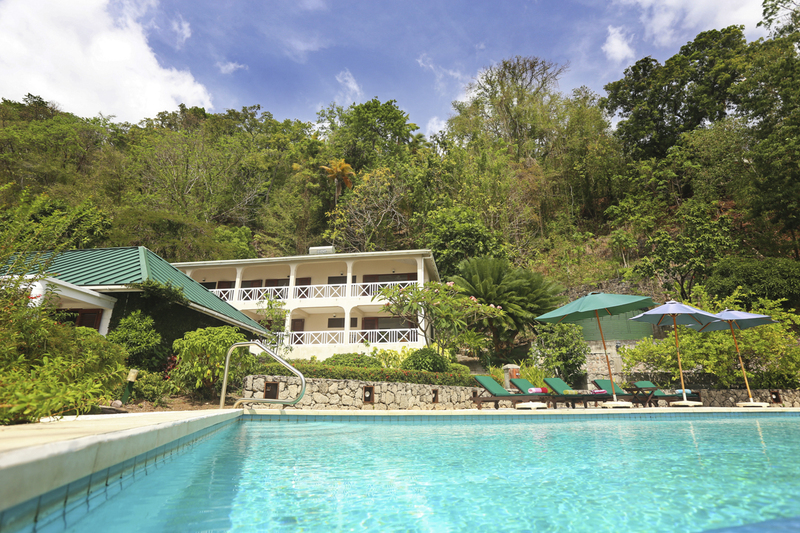 Even though Colibri Cottage and her environs provide everything you could ever wish for from a Caribbean holiday - including a beach within walking distance – you’re not far from delightful sightseeing spots along Saint Lucia’s west coast. 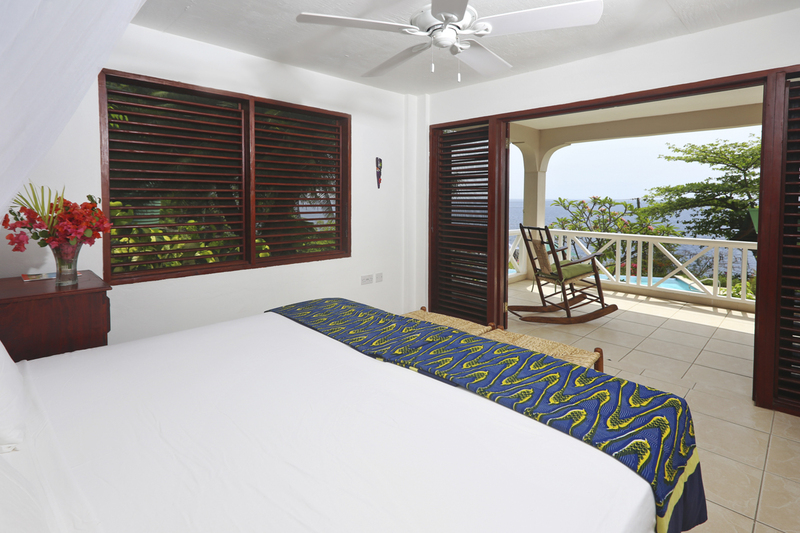 Colibri Cottage is located between the iconic Petit Piton and Malgretoute Bay. 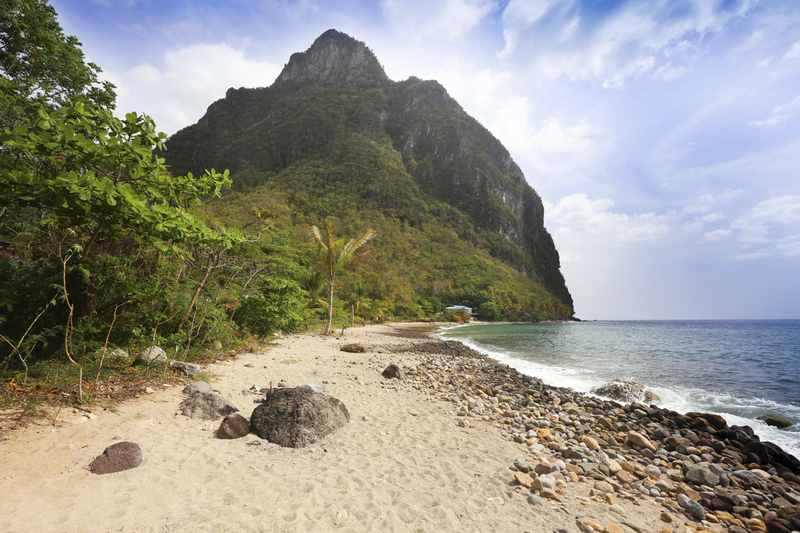 The Pitons are two towering peaks of rock, called Gros Piton and Petit Piton. The surrounding forest and natural landscape, including a volcano, thermal springs and park, have been granted World Heritage Site status by UNESCO and provide endless ways of investigating the lush vegetation, hikes, trails and therapeutic hot pools. A prestigious resort occupies a breath-taking position on a ridge between the two peaks. 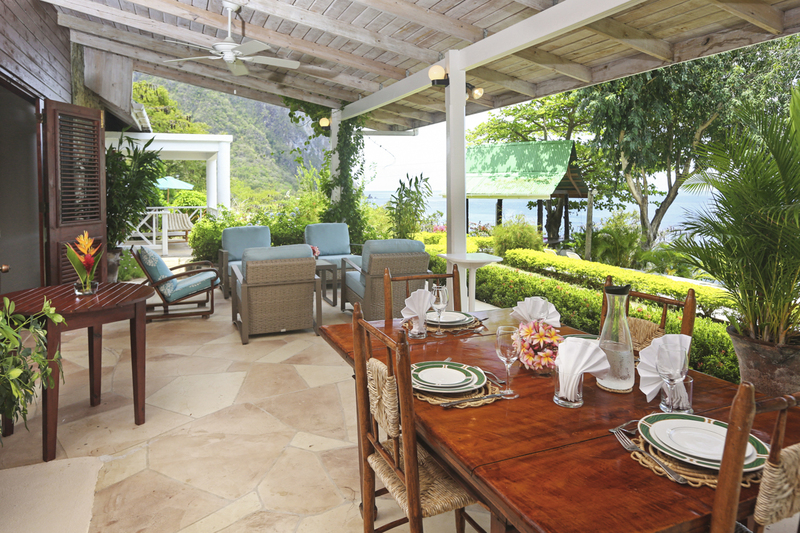 To admire this scenery at the end of the day, visit Ladera Resort’s sun deck for drinks at sunset. For top quality Caribbean cuisine, stay for dinner at the renowned restaurant, Dasheene. One of the best beaches along this coast is Anse Chastanet, and it’s only about fifteen minutes’ drive from Colibri Cottage. A pretty, curved stretch of white sand, head here for tropical sunbathing, umbrellas for hire, cocktails beach-side and fantastic snorkelling off-shore in the warm, crystal clear waters. The Marine Reserve around this area helps sea life to flourish, and the local shipwrecks offer exciting sites to explore on diving trips. 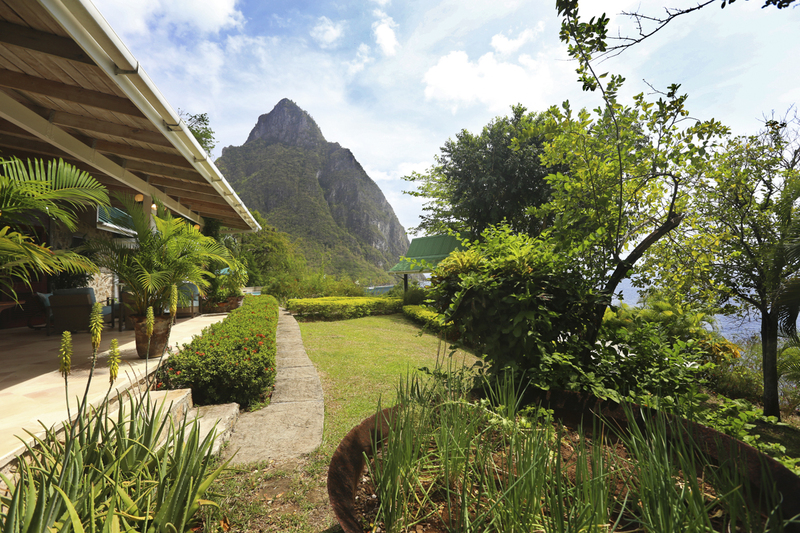 The original capital of Saint Lucia, Soufriere is considered to represent the heart and soul of the island. Old colonial buildings blend perfectly with a lively beach-front entertainment quarter, ensuring you experience the Caribbean in all its colourful, fascinating, multi-layered splendour. Bars, restaurants and hotels offer fabulous views as well as mouth-watering cuisine. You can easily visit Soufriere as often as you like during your stay at Colibri Cottage, as it’s only about ten minutes by car.